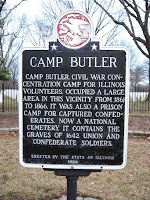 A waymark is a location or a specific symbol found at a specified location or route. Waymarking identifies specific points of interest. You mark these locations when you visit them by their GPS coordinates - latitude and longitude, so that others can find them. On http://www.waymarking.com you then post the information in the correct category with a description and photo to share with others on the site. Currently, Waymarking lists over 408,000 waymarks worldwide. The Waymarking web site has over 1,000 categories listed. 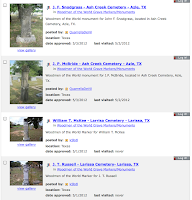 Fifty are in the cemetery category and include worldwide cemeteries, veteran cemeteries, churchyard cemeteries, abandoned cemeteries, Woodmen of the World grave markers, mausoleums and many more. 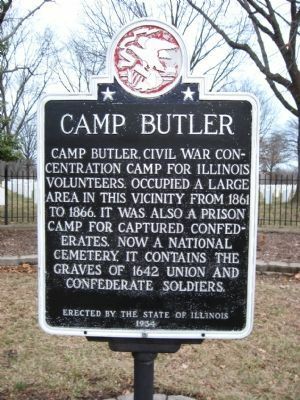 Waymarking also consists of groups. A group can be formed when 2 or more people volunteer to work together to manage the category they’ve selected. These group leaders will review the submitted information; making sure the GPS coordinates and information are correct. 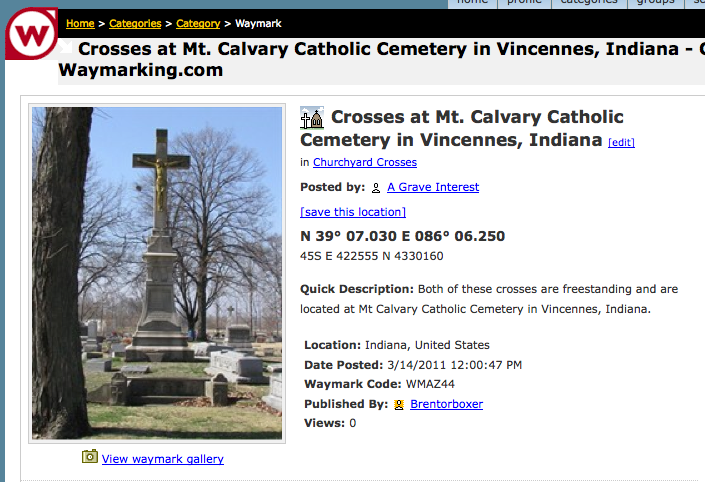 There are almost 1,800 groups currently on Waymarking, of these twenty-four groups exist under the search for cemeteries. 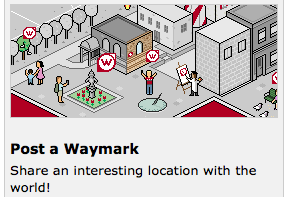 You can even do scavenger hunts with Waymarking. A scavenger hunt is a personal or shared challenge (game.) 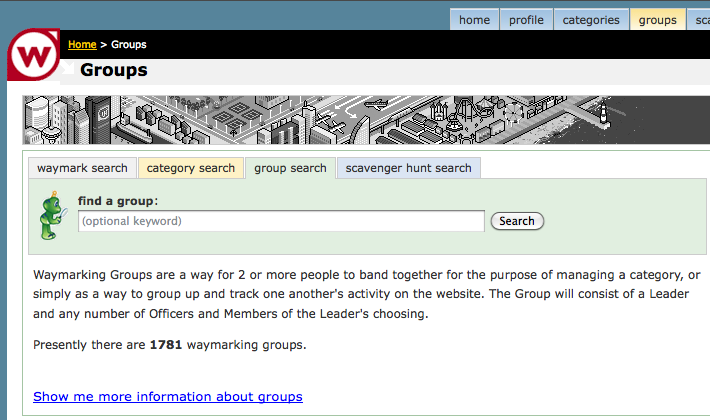 Scavenger hunts use a set of waymarks randomly selected for you, based on the criteria you enter. 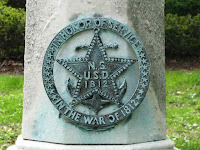 The goal is to visit each waymark, take a photo of yourself at the location, then log onto http://www.waymarking.com and post the pictures to get credit for each location visited. Credit consists of your success being logged on your Waymarking profile. 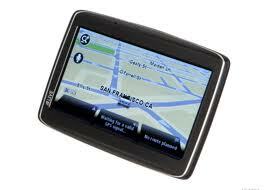 A scavenger hunt can include a simple search that covers a few miles near you, to over 200,000 square miles. You set the criteria you want to follow. Geocaching www.geocaching.com/ is more about the hunt for ‘treasure,’ a physical container located at the given GPS coordinates. The container usually holds a logbook. The geocacher enters the date the cache was discovered and signs the book with their code name. Sometimes toys or trinkets are also included in the cache as a bonus ‘find’. Geocaching has been described as a “high tech game of hide and seek.” Geocaching has been an outdoor sport since May3rd, 2000, the date it officially started. There are over 5 million people who take part worldwide, and over 1.7 million active geocaches currently in existence. Geocaching is very similar to Letterboxing, http://www.letterboxing.org/. Letterboxing can be traced to Dartmoor, England in 1854 when National Park Guide William Crossing placed a bottle for visiting cards from hikers and adventurers at Cranmere Pool. 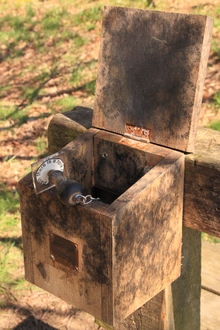 Letterboxers carry a personal journal of their finds, and mark it with the custom ink stamp found in the letterboxes. Letterboxing is still practiced, having spread from England throughout the world. Letterboxing began in North American in 1998. There are over 20,000 letterboxes hidden throughout the country. Clues may be found at the Letterboxing website. 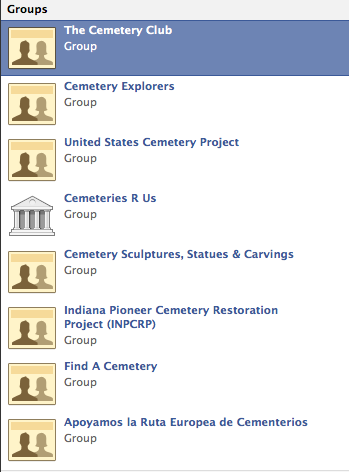 I personally enjoy scouting cemeteries on my own terms, posting photos and taking part in the cemetery group discussions on Facebook. 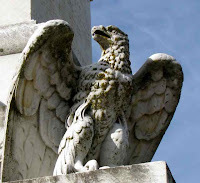 But waymarking, geocaching and letterboxing are also other options available where you can share your love of cemeteries and photos with fellow tombstone tourists. June is National Accordion Month. 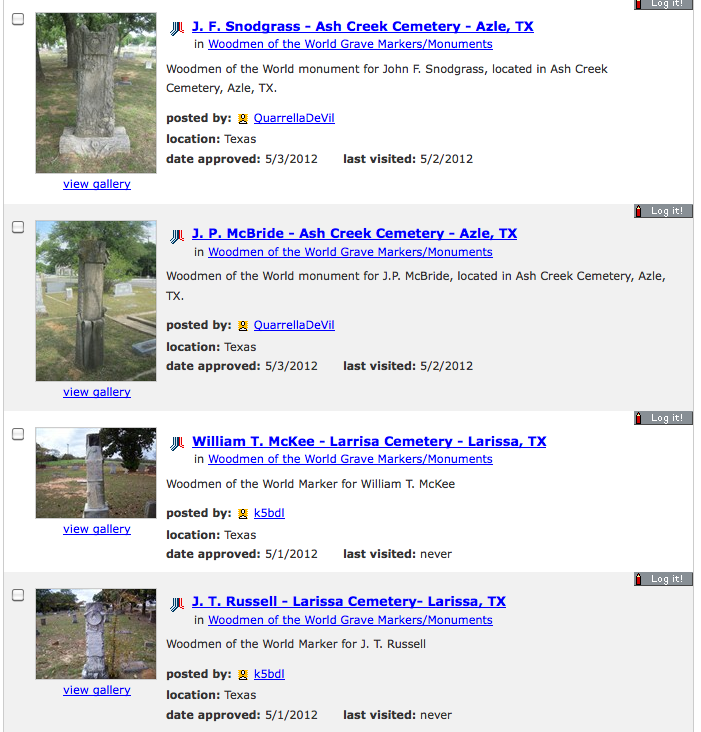 While at first this doesn’t appear to be a topic for a cemetery blog – it is. 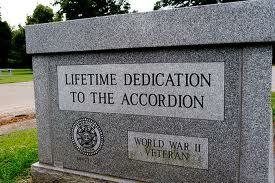 It seems that accordions do have their place in the cemetery. The accordion, also called the squeezebox is a bellows-driven musical instrument with keys that control the reeds inside the box. An accordion can be played solo and is usually considered a one-man-band instrument. 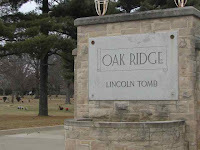 In Springfield, Illinois the grave of “Mr. 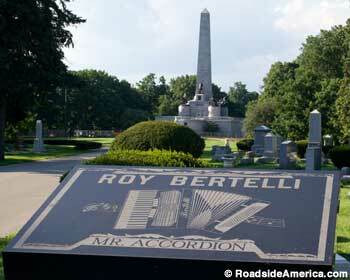 Accordion” holds a prominent spot in Oak Ridge Cemetery. 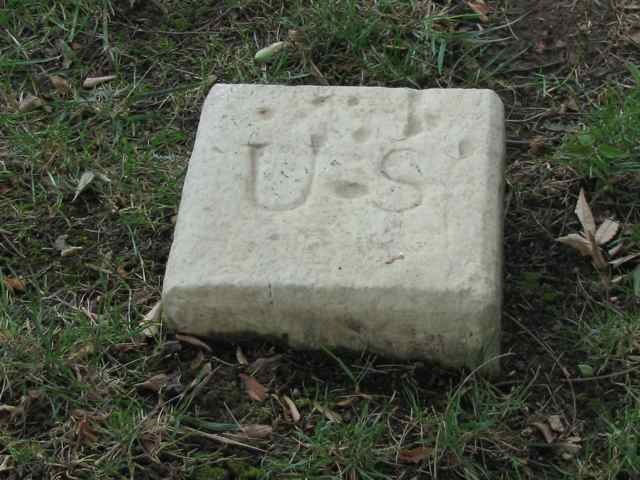 Roy Bertelli has a small plot within sight (and hearing distance) of Abraham Lincoln’s Tomb. Bertelli called himself “Mr. 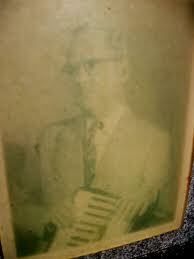 Accordion” and had a lifelong love affair with the instrument. He wanted to be remembered for what had given him his greatest joy in life. 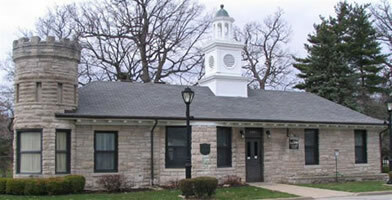 Bertelli, a Springfield resident, also wanted to be buried in Oak Ridge Cemetery. 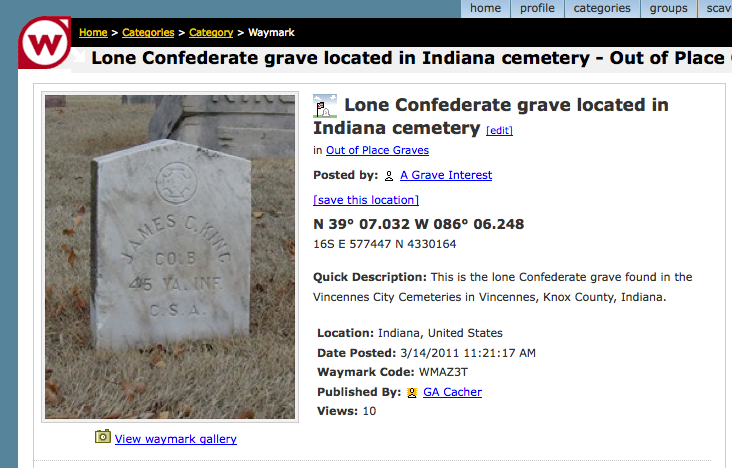 He approached the cemetery years ago to see if there were any plots available in the area he was interested in. 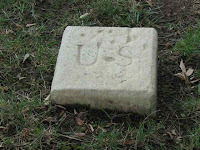 Cemetery personnal said that the tiny triangle of land near Lincoln’s tomb could be purchased. Bertelli was said to have bought it on the spot. 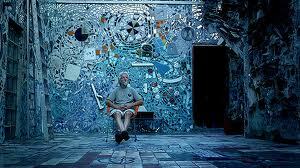 But a few weeks later he received a letter from the cemetery telling him that the plot was sold to him by mistake. 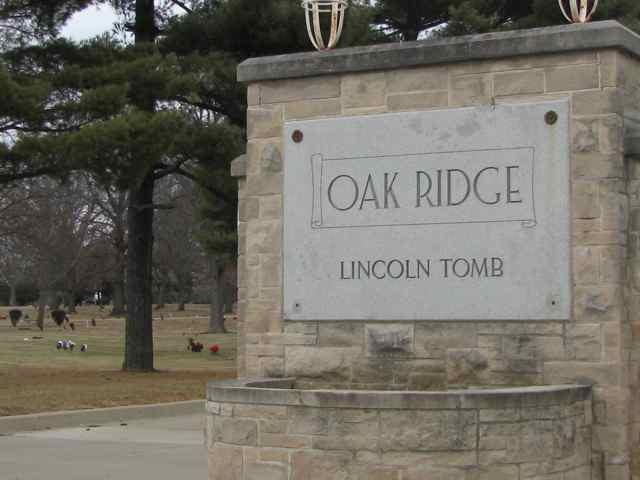 According to friends of Bertelli, he would have returned the plot to Oak Ridge – but then a second letter came from an attorney representing the cemetery making the usual threats if he did not comply with the return. Bertelli decided to fight. He not only refused to return the plot, he placed a two thousand pound above ground granite crypt with the image of an accordion carved on it and the words “Lifetime Dedication to the Accordion.” It is said that he paid $30,000 for the marker. Bertelli enjoyed showing up, standing on his crypt and playing the accordion for cemetery visitors, waiting to tour Lincoln’s Tomb, (Oak Ridge Cemetery has over 375,000 visitors each year,) much to the embarrassment of the cemetery officials and the City of Springfield. When Roy Bertelli died in 2003 at the age of 92, he succeeded in having the last laugh. 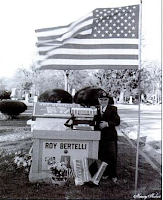 It seems that Bertelli was not buried in his accordion crypt as planned, but was interred at Camp Butler National Cemetery east of Springfield since he was a veteran of WW II. Rumor has it that his beloved accordions now reside inside the crypt. 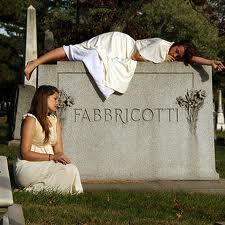 Another episode of cemeteries and accordions had to do with a site specific performance –walking tour. 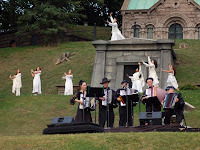 The performance group Angels and Accordions began to present shows set to accordion music in 2004. The Dance Theatre Etcetera and the Green-Wood Historic Fund for the Green-Wood Cemetery, located in Brooklyn, New York, produced the programs. A cast of thirty angels, dressed in white, ten accordions and an ensemble of classical music performers dressed in black, guided visitors through the cemetery to the sounds of original music composed for the event. Instead of the usual polka type music expected from accordions these musicians played more somber and deeper music. 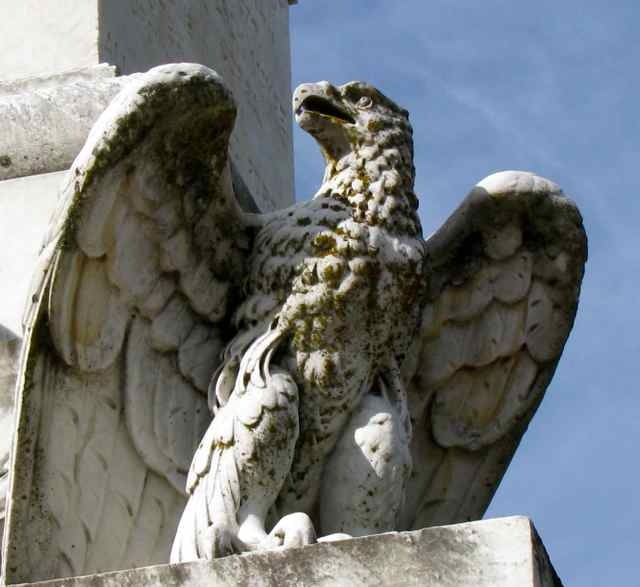 Singers and performers could be found interacting at gravesites, with statuary and monuments, among the trees, even in the cemetery’s catacombs - all performing to the melancholy music of accordions and classical instruments. Accordions were chosen as the lead instruments because of their portability. 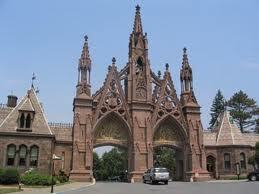 The idea of the show was to involve the public with the artistic works and music of the cemetery. It was a way to get people to see cemeteries not as repositories of death but also as beautiful places that can show us the complexities and richness of life. 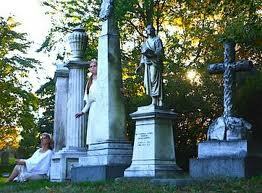 The performances were delightful and exciting, but as cemeteries teach us, all things must pass. It was decided in 2010 that Angels and Accordions had ran it’s course and the final program was presented on October 9, 2010. Although accordions are viewed more as a folk music instrument, they are gaining popularity in classical music, and as we’ve seen, they are also taking their place in cemetery lore. 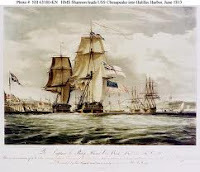 This Monday, June 18, will mark the 200th anniversary of the beginning of the War of 1812. Although a fledgling country, the United States showed it’s moxie by declaring war on the greatest power in the world, Great Britain. 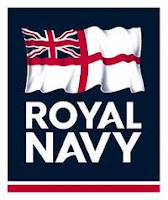 Americans were tired of Great Britain’s domineering attempts to restrict U.S. trade, the Royal Navy’s impressments of U.S. sailors into service for Britain, and the continual thwarting of America’s expansion into the western territory. 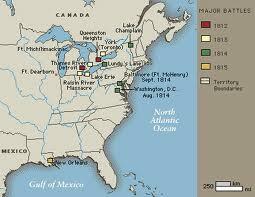 The war would last almost three years, ending on February 17, 1815 with the Treaty of Ghent. 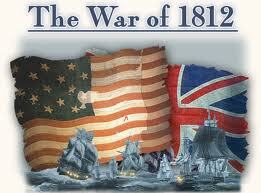 American’s viewed the War of 1812 as the second war for independence. (They had fought their first war for freedom from English rule almost 30 years before during the American Revolution.) This time Americans vowed to eliminate Britain’s hold on North America for good. It was time for the United States to become totally independent from Great Britain and Europe. Although the War of 1812 does not garner much attention now, it was a catalyst for many amazing and familiar events and facts that are part of our lives today. 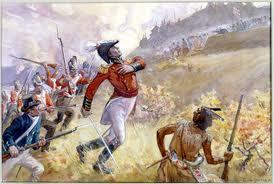 It was during this war that the U.S. invaded Canada three times. In the U.S., the War of 1812 is seldom celebrated but in Canada it is heralded as a time when the Canadians stood against the U.S. and won - all three times. 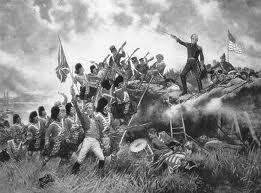 While the American Revolution won the U.S. its independence – the War of 1812 cemented it. America came out of this war as a power to be reckoned with. 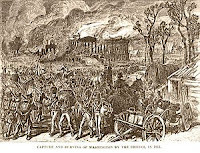 Patriotism was high after the British army captured Washington and burned the White House on August 24, 1814. American citizens saw this act as barbaric and rallied together for the defeat of the British. 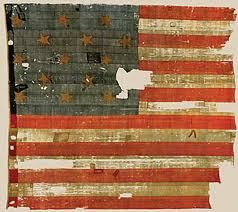 The U.S. national anthem was written less than two weeks later during the Battle of Fort McHenry on September 3, 1814. 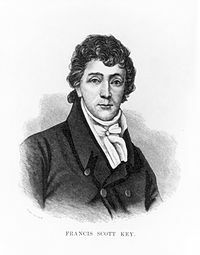 Francis Scott Key watched the conflict from aboard the HMS Minden where he was being held captive. Key was so inspired by the fight that he penned the words to what we now know as the Star Spangled Banner. However, when he wrote it, Key titled it the Defence of Fort McHenry. 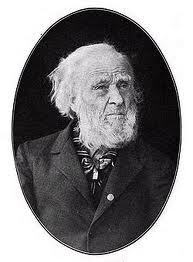 In April 1905, the last veteran of the War of 1812 died. 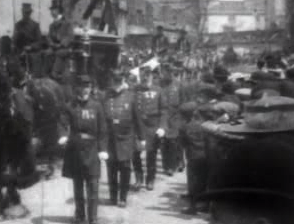 New York City held a Grand Parade to honor Private Hiram Silas Cronk, who died just two weeks after his 105th birthday. Cronk had spent his life after the war as a farmer in the state of New York. Also, in 1905, construction workers discovered the bodies of fourteen soldiers of the War of 1812 at what is now the Washington Navy Yard. 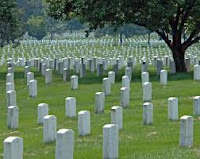 The remains were buried at Arlington National Cemetery later that year. 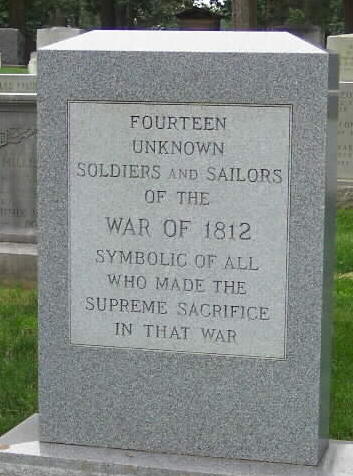 It wasn’t until April 1976, the year of the United State’s Bicentennial, that the Daughters of the War of 1812 had a monument erected at Arlington as a tribute to the fourteen unknown soldiers and sailors of the War of 1812, and to all others who had also died in that war. 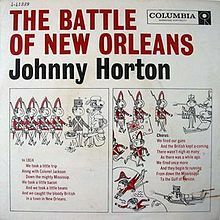 For many of us growing up in the sixties, singer Johnny Horton gave us our first understanding of the War of 1812 - set to music. Horton was a rockabilly singer known for his historical ballads. He recorded his number one chart topper, The Battle of New Orleans in 1958. 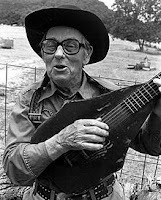 The song was written in the 1950’s by Jimmy Driftwood, an Arkansas school teacher. Driftwood wanted his students to become more interested in history, so he decided to put major events to music to get their attention. In 1960, the song won a Grammy for Best Country and Western Recording. Although the War of 1812 is known as the "Forgotten War," it is because of these three years of battles that America stepped out from Britain's shadow and became a world power to be taken seriously. Let us remember this on Monday and honor what our ancestors believed in and fought for.